Kalau nakkan bibir bersinar bak berlian bolehlah mencuba gincu edisi terhad dari Maybelline New York's. Kalau pakai gincu ni tentu orang ashik pandang ke bibir korang yang bersinar-sinar tu kan...dah tentu anda pun merasa bangga sebab di perhatikan. 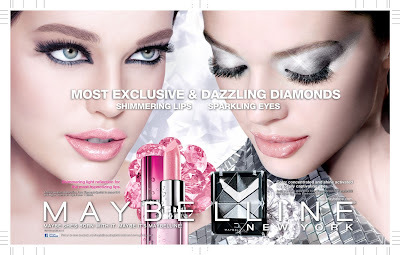 Maybelline New York Watershine Pure Diamonds namanya. Pure Diamonds tu..kalau beli pure diamonds tentu nak beli kena simpan duit dulu ek. Harga cuma RM24.90. Murah bukan. Kalau nak berlian tentu mahal kan. Jadi bila pakai gincu ni bolehlah berangan-angan macam dah beli berlian. Unlike conventional lipsticks, Maybelline New York Watershine Pure Diamonds consists of natural water, giving it a crystal-clear base. This also allows for unobstructed color clarity, which results in magnified shimmer. On top of that, its revolutionary particle technology gives Maybelline New York Watershine Pure Diamonds unprecedented dazzle, similar to that of diamonds! The particles found in Maybelline New York Watershine Pure Diamonds are perfectly cut for brilliant clarity. Not only that, its particles are dispersed tighter than most glossy lipsticks, giving Maybelline New York Watershine Pure Diamonds a nod above the rest. With this technology, more light reaches the surface of your lips, creating a luminous finish and multi-faceted shine, just like the gem! Add on its enriched Vitamin E formula and what you have is a lipstick that is not only trendy but also extremely soft and caring for your lips. Could you ask for anything more? With six limited edition shades, whether it is the sweet #302 or daring #S01, find your perfect shade with Maybelline New York Watershine Pure Diamonds. Housed in a hot fuschia casing surrounded by a diamond-like detail, it is exactly what you want in your vanity case. All about color, all about shine, Maybelline New York Watershine Pure Diamonds gives you not only lips that are hypnotising but also soft and luscious. Just what the trend experts call for! Maybelline New York Watershine Pure Diamonds is now available at all major retailers and pharmacies, priced at RM24.90. Get your favourite spring hue now and be trendy with Maybelline New York! With shine being the focus in makeup trends this season, why not try it for yourself to see just how much mileage you can get out of it? Maybelline New York Watershine Pure Diamonds lets you have all that glitters, simply by mixing and matching some of your favorite Maybelline products. Ready for your shine close-up? We share our step-by-step Watershine Pure Diamonds makeup application – just four simple steps to follow! Step 1, apply Clear Smooth Extra Powder Foundation all over face to keep oil production under control through the day; Step 2, use Angel Fit Blusher to give skin that fresh pop of colour; Step 3, use Hyper Diamonds Eye Shadow in WN-1 (a purple vixen palette) by first applying the highlighter all over eyes, followed by the medium light shade on eyelids, the medium dark shade to blend and the dark shade to line the crease of your eyelids; and finally, Step 4, give lips a luscious pink shine with Watershine Pure Diamonds Lipstick in 304. Step 1, use Maybelline Clear Smooth Extra Powder Foundation all over face for a smooth complexion; Step 2, use Hyper Diamonds Eye Shadow in GY-1 (a gun-metal grey palette) in similar steps as above; Step 3, intensify the smoky look with Hyper Diamonds Liquid Liner in Black (line from the inner corners of your eyes, extending slightly at the end; and Step 4, use Watershine Pure Diamonds Lipstick 302 to give lips a shimmery peachy plump look. Bila ek nak guna lipstik ni...bila pakai kang, suami akak kata..
inaaaa.....mimpi di siang hari ker? pakai lipstik ni misti muka berseri2 jugak ya!!! Oh ... tidak. Ella segan pakai jenis yg berkilat2 ni kak .. mcm nak tarik perhatian org je. Hihi ..
hahaha..lawakla hsbd kak ina ni..agaknya lipstik ni sesuai waktu malam jela ek..